October 17, 2014 Geren W. Mortensen, Jr.
A good while back, I made a post about my "Fit Kit." It referred to an ultra-portable, photos-on-the-go-fits-in-a-tiny-bag-goes-anywhere photo kit capable of excellent quality capture and image editing. The kit initially consisted of my Fujifilm X10 camera, Fujifilm X-20 flash, iPhone 5, and an Eye-Fi X2 Pro SDHC/WiFi card. Since I wrote about the original kit, a couple of things have changed. One, I purchased an iPad Mini, which replaces the iPhone 5 for image editing on-the-go. And two, Apple have updated iOS a couple of times, and have greatly improved synchronization across devices through their new-ish implementation of iCloud and Photostream. With iOS 8, the Photos app has been given powerful image editing tools that even allow fairly sophisticated raw conversion with supported cameras. These upgrades have made it easier than ever to shoot, edit, and upload from anywhere at almost any time. For instance, I made the image at left this morning in my kitchen. In only a couple of minutes -- total time -- I shot the image with the X10. By the time I set the camera down on the table, the image was ready and waiting for editing on the iPad Mini. I made appropriate adjustments in the iOS 8 Photos app, and clicked done. By the time I turned the camera off and turned to my laptop to write this post (I'm still looking for the ultimate in blog posting apps for iOS), the image was in my Photostream, ready to insert into the post, or upload to my favorite social media or photo sharing sites. If I weren't planning on using the image for a blog post, and just wanted to add it to my Flickr stream, I could have done that directly from Photos. I see this kind of connected workflow as the future of photography. More and more, camera manufactures are including WiFi functionality built right into cameras at all levels, and the communication and control apps are becoming incredibly sophisticated. This allows photographers to work in a "wireless tethered" mode that facilitates shooting and almost immediately viewing images on a large screen without being encumbered by a USB cable. While none of my current cameras have WiFi built in, the Eye-Fi X2 (or Eye-Fi Mobi) can add minimal wireless tethering to almost any camera, and they work well with all of the non-WiFi Fujis. They can't add remote control or real-time viewing, but they do allow fairly efficient transfer of images without the need of a time-consuming "import" step. The Eye-Fi cards also play well with Lightroom on a desktop or laptop. As you might be able to tell, I'm really excited about the future of iOS devices for working mobile for both photography and music, and even for everyday computing. December 26, 2013 Geren W. Mortensen, Jr. It's been a bit crazy around here lately, but we're spending a few days relaxing with family for Christmas. While at lunch today, I shot this through the restaurant window with my iPhone 5. Later on, I opened the file on my iPad and messed around with it in Perfectly Clear and Snapseed. December 10, 2013 Geren W. Mortensen, Jr. It's our second "winter weather event" of the week, and this one kept us both home from work all day. 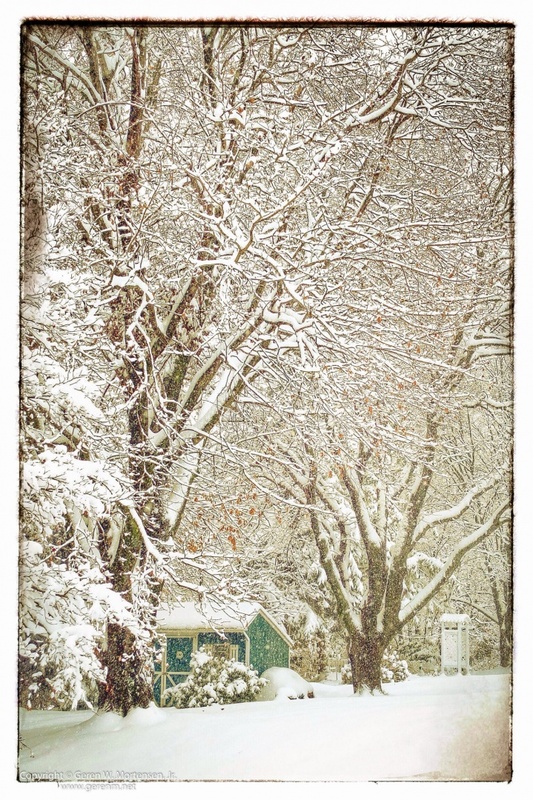 Between driveway shovelings, I walked out and made a few photos. November 24, 2013 Geren W. Mortensen, Jr.
Last night, at band practice, I tried an experiment. We were faced with the possibility of playing a gig at an impossibly small venue, and there was no way that my usual two-tiered-plus-pedals-plus-amp keyboard rig was going to fit. I had to "pare it down." At the same time, another friend and I have been developing the concept of an incredibly portable band, which would be made to look like something very retro and cigar-box-guitar-like. Enter the iPhone 5 as a musical instrument. Combined with a tiny Korg keyboard controller, running the iOS version of GarageBand, and built into a nifty little box, I can have virtually any keyboard instrument I need. The only drawbacks: only a two octave keyboard, and only one sound at a time. After several hours of practice, I found that I can easily play almost every song we do! The problems were a song with palm-slide organ intros, and another with a keyboard solo that lands in an odd spot on the keyboard. Even when using an iPhone as the sound source, I had an amazing amount of control. For instance, when playing the organ, there are screens to access all the important controls of the quintessential Hammond B3; drawbars, rotary controls, and options for distortion and percussion are all available. So far, I'm using just Garage Band for my sounds, but there are many other options available through Apple's App Store. When we get the iOS keyboard fully finished, I'll post a picture or two. 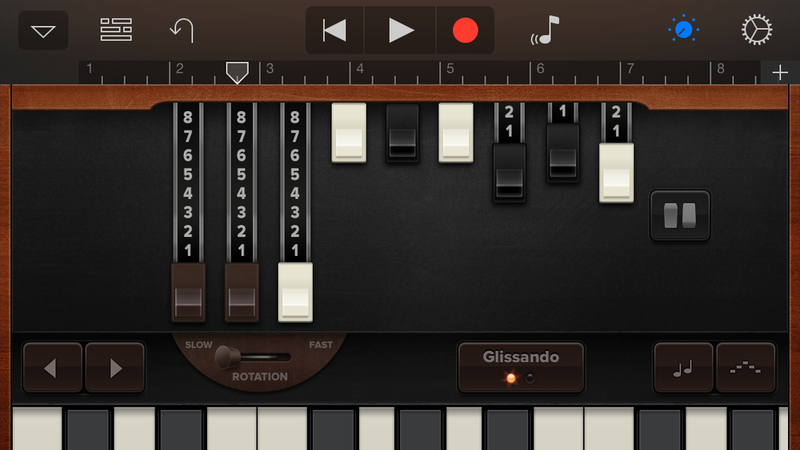 I've also got plans for some other iPhone/iPod Touch-based instruments. Another great use of iOS devices is as a "teleprompter." For instance, since I had a slight nervous breakdown several years ago, I find in impossible to remember songs. I've found a great app for the iPad called OnSong. I can load my "charts" in text, Word, Pages or Chord Pro formats, and the app can format the files for easy use on stage. Moving through the pages of the song, and from one song to the next in a set list. can be accomplished using a bluetooth foot controller like the iRig BlueBoard. Installation and operation of OnSong and the BlueBoard driver was a snap, and OnSong does a great job of interpreting my song files. ChordPro comes in the easiest, but as I said, Word, Pages or plain text work as well. Once imported, songs can even be transposed on the fly with just a couple of taps on the screen. OnSong can also be used on an iPhone, but it's just a bit difficult to see. Keyboardists and singers like me are not the only ones who can benefit from using iOS devices on stage. There are hardware/software devices that allow an iPhone or iPad to be used as an multi-effects processor. IK Multimedia's iRig seems to be the industry leader here, but there are also other options available. And, of course, there are iPad and iPhone apps to allow control over various aspects of several popular digital mixing systems. For instance, on Behringer digital mixers, an iPad gives complete control over mixer operations, while an iPhone can give performers on stage control over their monitor mix, and several iOS devices can be active at the same time. Mackie's DL-series mixers, and Behringer's upcoming iX16 use an iPad as the entire control surface -- the mixers themselves have no controls, just a bay to hold an iPad. I purchased an iPad mini to use as for reading, mobile image editing and also as a prompter -- I think it's ideal for a singer who wants teleprompter and monitor mix control. It's big enough to be read easily when mounted on a mic stand, yet small enough to be relatively unobtrusive.